We are located at 74 Fairmount Avenue in the Hyde Park neighborhood of Boston, zip code 02136 – convenient to Readville, Milton, Dedham, and our Boston neighbors in Mattapan, Dorchester, Roslindale, West Roxbury, and Jamaica Plain. We are at the corner of Fairmount Ave and Pierce Street, across from the fire station. If you are driving, please allow 15-20 minutes to find a parking space. Parking is challenging in this area. We are at the red marker. Green shows nearest on-street parking; the green square is the nearby Municipal Lot. 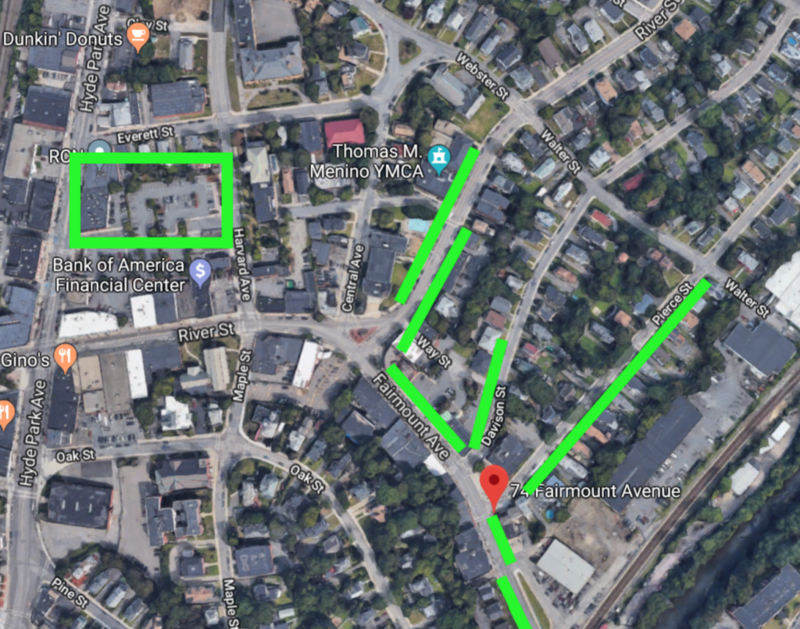 From Ashmont/Peabody Square on the Red Line, connect to the Mattapan Trolley to Mattapan Station, then take the #24 bus toward Wakefield Ave; our stop is Fairmount Ave opposite Nott Street, directly across the street from the clinic. Or, on weekends, take the #24/27 bus directly from Ashmont to Nott Street. From Mattapan Station, take the #24 bus toward Wakefield Ave; our stop is Fairmount Ave opposite Nott Street, directly across the street from the clinic. From Mattapan Station you can also take the #33 to River Street at Central Ave; walk left onto River Street which becomes Fairmount Ave. Make sure the theaters are on your right. As the road curves to the right, you will see the Vertullo building up ahead on your left. From Forest Hills Station on the Orange Line, take the #32 bus down Hyde Park Ave to Grant Place, a 0.3 mile walk away. Directions: Walk down Hyde Park Ave (in the same direction the bus was going) for about one block until you reach River Street, which will become Fairmount Ave. Go left on River Street – diagonally across the intersection to make it easiest – and walk straight through the next square, so that the theaters are on your right. As the road curves to the right, you will see the Vertullo building up ahead on your left. From Roslindale Village, take the #50 bus toward Cleary Square, getting off at the Gordon Ave stop on River Street, a 0.3 mile walk away. Walk left onto River Street which becomes Fairmount Ave. Make sure the theaters are on your right. As the road curves to the right, you will see the Vertullo building up ahead on your left. We are closest to the commuter rail stop Fairmount Station on the Fairmount Line from South Station, connecting Uphams Corner, Four Corners/Geneva, and Talbot Ave in Dorchester, and Morton Street in Mattapan. We are about 0.3 miles from Hyde Park Station on the Providence/Stoughton Line, connecting to Canton and Stoughton. Try calling or emailing us.